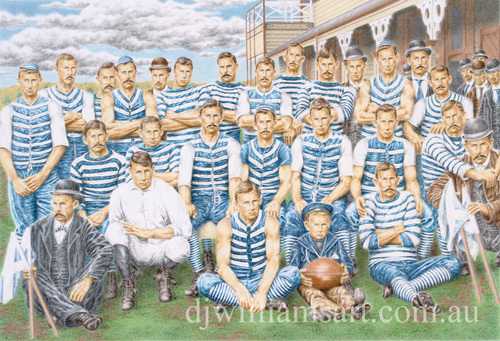 Geelong lost a number of important players from its list as it went into the 1896 season. The club's most reliable man in front of goal, Charles Decoit, was amongst them. While the champion forward had left in search of work on the mines in Western Australia, others, such as McKinley, Davis and Marmo, had moved in closer to Melbourne and would play for the Footscray club. Marmo was a great loss to the club. He had been Geelong's most reliable man in the back-half for some time and his knack for turning defence into attack would be sorely missed. Marmo would be always fondly remembered at Geelong for the role he played on several occasions in negating the influence of champion Essendon forward, Albert Thurgood. The 1896 team could, however, still boast a star-studded line up. Inspirational captain, Jack Conway, would again lead the team onto the field. He would be ably assisted by big men, Peter Burns and Henry Young, while centreman, Teddy Rankin, was expected to only increase his value to the team. Geelong would also be well served by three of the McShane brothers, Joe, Jim and Henry. There was much for the Geelong people to look forward to and they were not disappointed when the year kicked off with a solid win against Port Melbourne. A narrow loss to Melbourne after the bye in week two was not enough to raise any real concern at the club. Geelong was then put to the sword by South Melbourne and the losses began to mount up. The players had given themselves every chance for victory in each encounter, but continued to stumble at the final hurdle to lose by the narrowest of margins. A win over the highly fancied Essendon broke the run of losses and continued a trend between the two clubs which, for much of the decade, had seen the team expected to win fail in its attempt. Geelong then disposed of Williamstown by twelve goals before the disappointments continued. But for a solid win against the struggling Richmond, there was little for the club's supporters to cheer about. The season ended with Essendon wreaking revenge for their earlier loss. Despite the disastrous final standing of eleventh place, it is difficult to judge the 1896 team too harshly. They fought valiantly in all of their matches, and on those occasions when a loss was registered against their name, they had fallen just short of victory on each occasion. Geelong was set to enter a new era in the VFL with a team not so different from the one that competed in 1896. The 1897 season would, however, give the people of Geelong far more enjoyment than what they had just endured.